We visited Bartholomew’s Cobble, a National Natural Landmark located on the southern edge of the Berkshires, for a hike on Sept. 22, 2013, the Autumn equinox. The hike was led by Rene Wendell, the affable and knowledgeable ranger who oversees the Cobble, which is a property of the Trustees of Reservations, the oldest regional land trust in the world. Bartholomew’s Cobble’s 60 acres contain a degree of biodiversity that matches the 60,000 acres of Acadia National Park in Maine. We hiked along fewer than half of the Cobble’s 5 miles of trails, in order to identify species of ferns, visit the Housatonic River floodplain area where 1,800 trees were planted in a recent restoration project, including Silver Maple, Box Elder, Cottonwood, Sycamore, Tulip Tree, Hackberry, and seven varieties of disease-resistant Elms, and to see Wendell enter the 2nd largest Cottonwood tree in the state, a 230 year-old specimen which was #1 until a storm felled a giant limb. Bartholomew’s Cobble, Sheffield, Massachusetts, view of a ledge with ferns; photo: wiki user Daderot. Bartholomew’s Cobble is a 329 acre site, owned and administered by the Trustees of Reservations, that was created by geologic upheavals when the Taconic and Berkshire ranges were formed. It is a 100′ high bedrock outcropping, containing 800 species of plants, that began as coral reefs, shells, and sand as many as 500 million years ago when this area was an inland sea. When the Taconic and Berkshire mountains were formed, the still-forming strata were pushed upward and flipped over, leaving the rough and rugged underbelly exposed for millennia. The reservation’s more recent farming history lives on through herd of cattle grazing along the river. 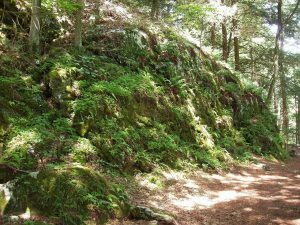 The cobbles consist mostly of quartzite and marble, whose alkaline soil supports an unusual array of flora – you’ll find one of North America’s greatest diversities of fern species here. The reservation also boasts one of the largest Cottonwood trees in the state. 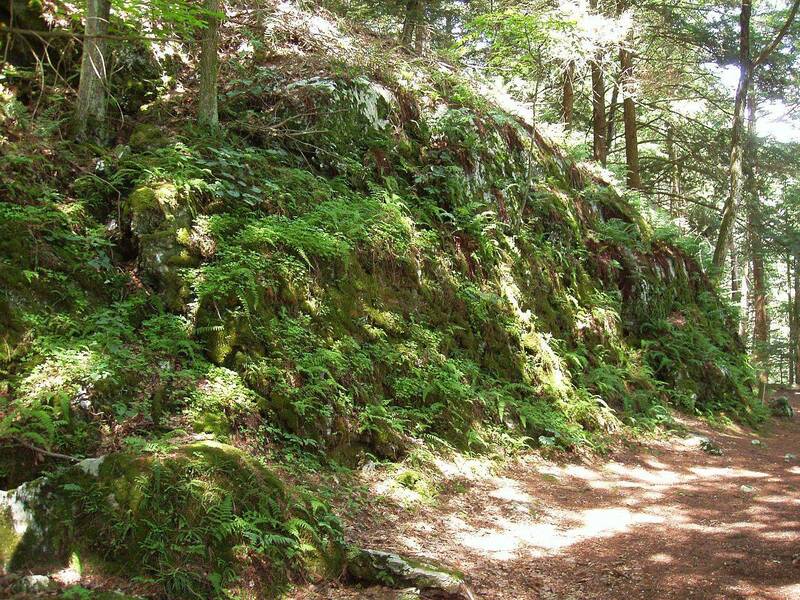 It’s this amazing diversity that led to the Cobble’s designation as a National Natural Landmark in 1971. 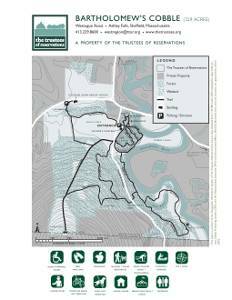 Download Bartholomew’s Cobble trail map (PDF). The high point at Bartholomew’s Cobble, Hurlburt’s Hill, rises 1,000 feet to a 20-acre upland field on the Massachusetts–Connecticut border that offers panoramic views northward up the Housatonic River Valley. From Rt. 7 South in Sheffield, turn right onto Rt. 7A and follow for 0.5 mi. Turn right onto Rannapo Rd. and follow for 1.5 mi. Turn right onto Weatogue Rd. to entrance and parking (30 cars) on left. From Rt. 7 north in Canaan, CT, turn left onto Rt. 7A and cross state border. Turn left onto Rannapo Rd and follow for 0.8 mi. Turn left onto Weatogue Rd. Continue as above.